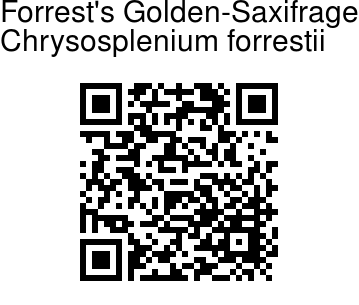 Forrest's Golden-Saxifrage is a perennial herbs 8.4-22.8 cm tall. Basal leaves have leaf-stalk 9-13 cm long, leaf blade kidney-shaped, 3-5.2 x 3-7 cm, below and at sinus brown hairy and papillose, above hairless, margin shallowly 15-26-toothed, teeth flat at tip. Stem leaf 1; leaf-stalk 0.6-9 cm, leaf blade kidney-shaped, 2-3.4 x 4.1-5.2 cm, below and at sinus sparsely brown papillose, above hairless, margin shallowly 22-29-toothed, teeth mainly not overlapping at margin and tip retuse. Flower cyme 3.3-4.3 cm; bracteal leaves kidney-shaped to flabellate, 0.7-2.8 x 0.8-3.5 cm. Flower-stalks are 0.3-4 mm, sepals somewhat spreading, overlapping, broadly round, about 2.1 x 2-3 mm, tip blunt. Stamens are shorter than sepals; filaments about 0.9 mm. Capsules are about 3 mm, tip flat, rostrums about 0.4 mm. 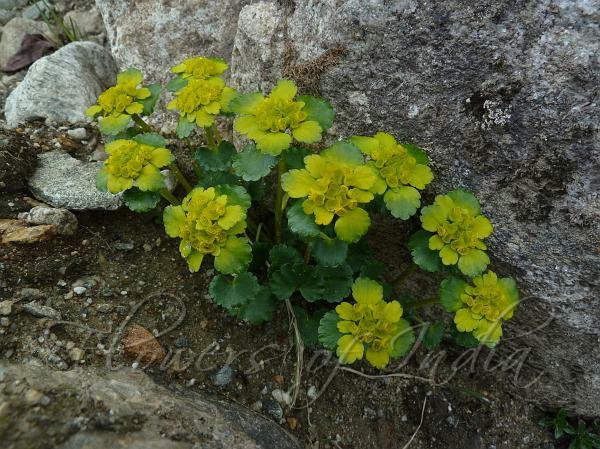 Forrest's Golden-Saxifrage is found in Eastern Himalayas at altitudes of 3600-4700 m, in SE Xizang, NW Yunnan, Bhutan, NE India, N Myanmar, Nepal. Flowering: May-October. Identification credit: Magnus Lidén Photographed enroute to Bumla Pass, Arunachal Pradesh.